Guest blogger GPO Public Relations Specialist Emma Wojtowicz discusses a publication about safety in schools. School safety is a concern. The recent school shooting at the public high school in Chardon, Ohio, reminds us that any school is susceptible to violence and tragedy. Indicators of School Crime and Safety: 2010, a publication by the Department of Education and Department of Justice, thoroughly examines the various indicators that threaten the safety of our nation’s schools. The information and data in this report was collected through surveys conducted from 2007-2009. While this report is regularly published to help policymakers and schools develop ways to keeps schools safe and prevent crime and violence, it makes for an interesting read given recent events. The report identifies 21 indicators that threaten the safety of schools. The indicators encompass a variety of problems like victimization, bullying, injury, fights, use of drugs and alcohol and weapons possession. Charts and graphs illustrate the data collected about each of the problems with breakdowns by age, ethnicity, gender, public versus private school, and urban versus rural school location. 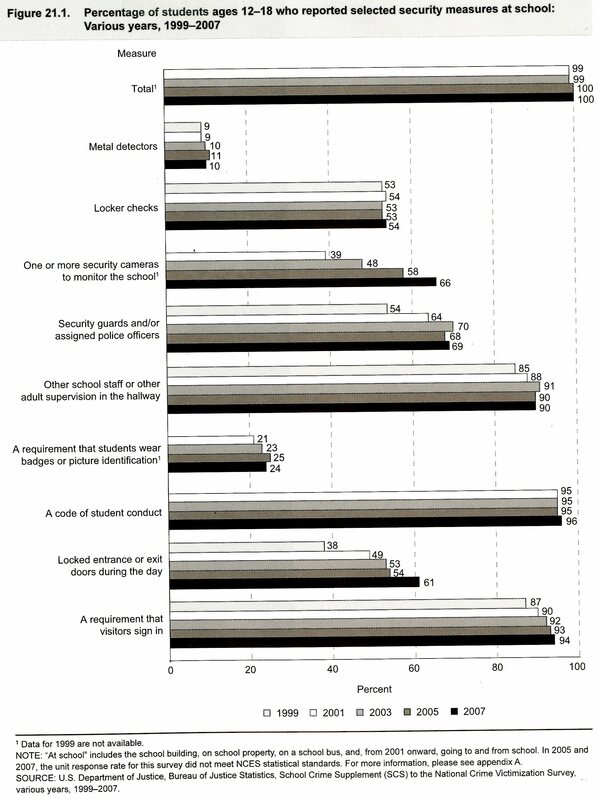 There are also comparisons for some indicators between being at school and outside of school. The content is organized well with a brief explanation about each indicators followed by the data depicted through charts and graphs making for easy navigation if there is a specific topic you are interested in. It is difficult to analyze these statistics and determine whether or not schools are safe. From scanning the various line graphs, it is easy to notice there has been a decline over the years from the mid-1990s to 2009 regarding most of the indicators. 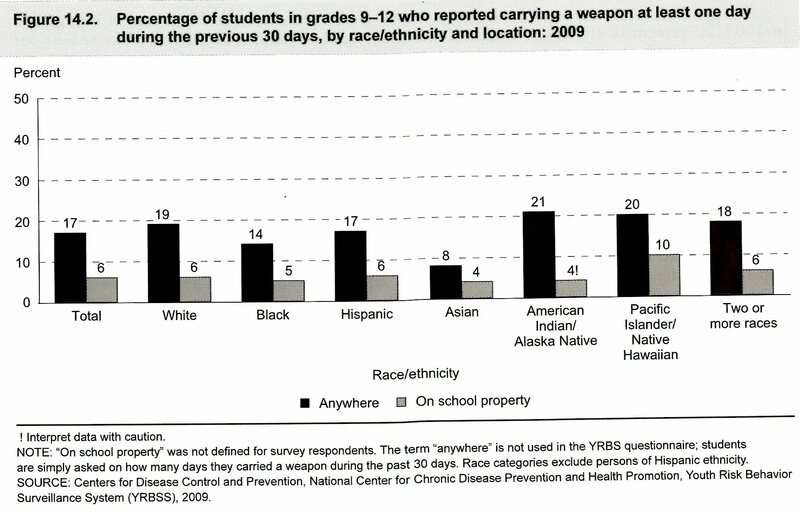 Hopefully, this data is used to improve and strengthen the safety of schools. As our country was reminded on February 27 in Chardon, Ohio, any school is at risk and we must be steadfast in the effort to reduce the risks that leads to tragedy. HOW DO I OBTAIN THIS “Indicators of School Crime and Safety: 2010” BOOK? This entry was posted on Friday, March 9th, 2012 at 11:39 am and is filed under Department of Education, Department of Justice. You can follow any responses to this entry through the RSS 2.0 feed. You can leave a response, or trackback from your own site. This article is an inspiration. You are a profound and insightful writer that knows how to get your point across with interesting and quality content. You are wonderful with words. I agree with you 100%. I would hesitation, for one thing, however consider this not really worth referfing to. Muchas Gracias for your blog post.Thanks Again. Really Great. It would be interesting to see how are these trending over the last 10-20 years. Many of the charts in the book show trends back to 1999 or thereabouts, which does provide a chance to evaluate trends. This entire article appears to be an attack on gun ownership. More people (1,600,000 since 1948) have been killed by drunken or otherwise impaired drivers than by unjustified use of firearms. A better use of your time would have been to support long prison terms for driving while drunk or drug impaired.